In the months leading up to the press conference earlier this week, speculation about the prospects for Amazon’s(s amzn) new tablet reached a crescendo. Would the new tablet be a worthy competitor? Might it even dethrone the iPad? Since Monday, when CEO Jeff Bezos took the stage to unveil Amazon’s new tablet, named the Kindle Fire, individuals have posted some 11k+ comments in sources tracked by SocialNuggets, a leading social media analytics firm. Mining these data gives us an early indication of how the market views and may react to the Kindle Fire when it is introduced mid-November. 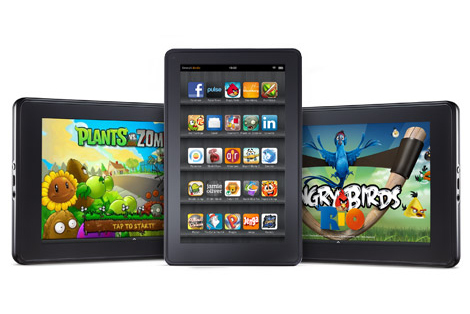 Will the Kindle Fire unlock demand for tablets? While not available for another six weeks, almost 10% of individuals posting comments earlier this week explicitly indicated whether they intend to purchase a Kindle Fire or not. These early results bode well for Amazon – among those expressing intent, the number intending to purchase a Kindle Fire outnumber those “rejecting” by 2:1. Of course, that leaves a large number with intent “unstated,” so we (and competitors) will be watching these numbers closely. As more individuals express views about the Kindle Fire, the data will permit us to report not only the Intent to Purchase Ratio but also break out users’ reasons for (intending to) purchase a Kindle Fire or not. At $199, the Kindle Fire is priced at less than half the prevailing prices for an iPad and most other tablets on the market. Not surprisingly, Amazon’s bold pricing generates considerable enthusiasm among prospective buyers. Almost 10% of the comments contained a favorable mention of Fire’s pricing – previous research from immr has shown that tablet prices must drop below $300 to open up the tablet market beyond early adopters, so Amazon has clearly hit the mark with respect to pricing. Although overshadowed by price and other features, Amazon also introduced a new browser named Silk that is integral to the overall user experience. Touted by Amazon for its “optimized content delivery,” the browser generated quite a bit of discussion among early posters. While the “cloud” was most frequently mentioned in connection with the browser, a significant percentage of individuals commenting on Silk – 1 in 3 – expressed concerns about privacy. In the days following Amazon’s announcement, tech writers have also begun to explore the privacy implications of Silk. Clearly, Amazon will need to monitor views closely and address concerns at it brings the Kindle Fire and its “split, cloud-based” browser to market. Is the Kindle Fire hobbled by missing features? Surprisingly, a very small percentage of individuals’ comments mention Fire’s “missing features” – for example, only about 1% commented on the fact that Fire will not offer 3G, while even fewer commented on the fact that the initial model due out in November lacks a camera. While Amazon is taking a calculated risk by leaving these features out, evidence from other sources supports their decision – based on immr research with prospective buyers, at the low-end of the market only 1 in 3 choose tablets with 3G (the majority choose lower-priced models with Wi-fi only). immr’s research also shows that most prospective buyers expect to use a tablet “primarily at home,” so 3G, especially given the incremental price and monthly recurring cost, is not a highly sought tablet feature at present. In addition, out of some 15 tablet features that immr examined using Choice Modeling, cameras rank #12 in terms of impact. Apparently, consumers are content having cameras on their smart phones and are not overly concerned that tablets and the Kindle Fire in particular lacks a camera. However, given the relatively low cost to add a camera and the growing popularity of video chat on Skype and other services, we suspect that Amazon will offer this feature on future models of the Kindle Fire. Has Amazon hit the sweet spot? While these results are very preliminary and should be interpreted accordingly, these “early votes” suggest that Amazon has hit a sweet spot with the Kindle Fire. Pricing is a big plus and the missing features don’t appear to be major deficits. While privacy with the Silk browser could be a significant issue, we suspect most users will accept the trade-offs and “trust” Amazon with this data – nonetheless, Amazon will need to closely monitor and carefully address users’ concerns. 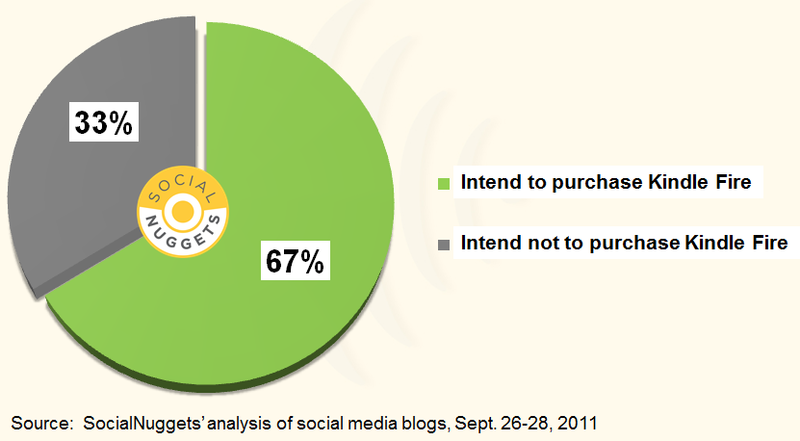 Of course, sentiment could shift as more information become available and users get more familiar with the Kindle Fire. As SocialNuggets continually tracks these and related sentiments, additional findings will be reported throughout the weeks ahead and of course after Amazon launches the Kindle Fire in November. Stay tuned! Dr. Phil Hendrix is the founder and director of immr, a leading research and consulting firm focused on markets for “very new products” and an analyst with GigaOm Pro. R. Paul Singh is the CEO and co-founder of SocialNuggets, which delivers real-time data and market intelligence to the consumer electronics industry by analyzing millions of social media conversations about products. I’d like to see a 3G model and I expect that “Fire 2” will be introduced in 2012 with 3G and a camera. But for $199 I trust the Amazon brand enough to give it a shot. We all need to wait for Apple’s product announcements on Monday. Apple is not going to throw away the lead it has. 1. Your pre-order of multiple units is especially important. It will be interesting to see how many other consumers purchase more than one Fire – the < $200 price tag makes the Fire more "affordable" for a wider range of purchases, including gifts and others like the ones you cite, whereas $300+ undoubtedly gives consumers pause. 2. The "usage situations" you mention are also noteworthy, as the Kindle Fire is a good fit for each – web browsing, e-mail, small enough to fit in a purse, used mainly on Wi-fi, etc. In support of your points, our tablet research shows that none of the top 5 "expected uses" involves "creation" – we've just posted findings on Consumers' Top Expected Tablet Uses at http://bit.ly/jAFk8L. 3. You also reinforce the compelling logic that underlies Amazon's strategy – "why make consumers pay for functionality that they aren't likely to use?" OEMs often "overshoot" on features, which leads to "feature fatigue" among users and creates opportunities for companies who understand the features that customers value (and do not value). Scott Anthony of Innosight (Clayton Christensen's firm) has a thoughtful discussion of this phenomenon – see Innovating in Overshot Circumstances at http://bit.ly/pBc9xL. Thanks again for your comments. I hope other readers share their views on why they plan to purchase a Kindle Fire (or not). Include me in the group that intends to purchase a kindle fire. My wife was going to get an iPad for Christmas, yesterday I was informed that she would rather have a Kindle fire. She says it will let her surf the web read books check Email and play some games and she doesn’t need 3G and a lot of memory. She also prefers the Kindle’s size. B&N is coming out with Nook Color 2 shortly that will have Netflix app among others. Kindle Fire is no more media tablet than even current Nook Color, most specs are the same, just a bit faster. Kindle Fire doesn’t have microSD slot that Nook Color has thus it is stuck with 6 GB usable internal storage unlike Nook Color that can get up to 32 GB card in. Nook Color still has the best on the market anti-glare coated screen that is better for reading/viewing outside. Also, current e-Ink Nook Simpletouch is still better designed than even the new Kindle Touch with battery lasting two months with ONE hour reading with Wi-Fi off thus it’s still twice as long as new Kindle’s two months with HALF and hour a day with Wi-Fi off. It looks like Kindle didn’t get any battery improvement in the new model. More, Kindle Touch still flashes black on each page turn while Nook Touch reduces the flashing by 80%. If you walk in with the Nook to Barnes & Noble store, youâ€™re allowed to read ANY available eBook for free while in the store via free provided in the store Wi-Fi. Also, the prices that you hear around for the new Kindles are all for models that force you to look at advertisements. Normal units cost $30-50 more. For example, Kindle Touch goes for $139 that is the same as Nook Touch while Kindle Touch 3G goes for $189. Never say never but does anyone really believe Apple will price anything below a competitor? If they do come out with a 7″ look for $225 and some silly feature not on the Fire. One must wonder if the Fire is a “loss leader” considering development and manufacturing cost of the Fire. JT – iSuppli’s Teardown Analysis puts the Kindle Fireâ€™s bill of materials (BOM) cost at $191.65; with manufacturing expenses added, total cost = $209.63. Details at http://bit.ly/qeSIXb. With pricing below cost and the integration of content, Silk browser, and other features, Amazon clearly intends the Fire to be a “content delivery system” that generates incremental revenues well into the future. Already purchased two of them… As for the monitoring garbage… They are NOT monitoring individuals, any more than this blog, or any other website or your own ISP. That is a false statement by those who fail to understand what SILK is. It sees every page visited, like google, and those pages visited most frequently, are pre-fetched. Unless the WORLD is visiting YOUR PAGES, which are already public anyways… then YOUR information is not stored in SILK. They store first pages like google, amazon, msn, etc… So when you visit them, they are already loaded for the day. They are not visiting your HTTPS (Secure) personal pages. Besides, those are secured and encrypted, they couldn’t re-display them if they wanted to. The decryption is only on your kindle-viewer and the servers on the other side. Stop spreading that garbage. lol. It only makes you look like you have no idea what you are talking about. Another part about privacy. I’m surprised no site/blog seems to be reporting it, but it took me 2 minutes to find in Amazon Silk’s terms and conditions that Silk includes a basic or ‘off cloud’ mode. This means the Silk now acts just like any old browser when in basic mode. it talks about it here. Jason, since Amazon is offering “free premium subscriptions,” they will be in a unique position to link clickstream and other data, much as Google does with Chrome and G-mail. Subscribers already entrust Amazon with significant personal data – with Silk, Amazon will have access to even more, so I wouldn’t dismiss users’ concerns as “garbage…” Anyway, glad to see that you are keen on the Kindle Fire. What led you to purchase before even seeing the device? Dr. Hendrix, I know your comment is directed towards Jason, but since I’ve already pre-purchased several Kindle Fires myself, I’d like to give you my thoughts. I’ve pre-ordered a Kindle Fire for myself, my mother, my sister, and my younger cousin. I’ve been wanting a tablet computer for awhile now, but I wasn’t willing to pay $499 for one, since I would use it primarily as a consumption device. I’m a biologist and I currently use an Acer AspireOne netbook which I use in the lab and also occasionally bring into the field. I started seriously examining my usage scenarios over the past six months to determine which tablet, if any, would meet my needs. What I found was that most of my computing revolved around having access to PDFs, occasionally browsing the web, sending and receiving email, and referencing textbooks through the Kindle for Windows application. While an iPad gets about 2 to 3 more hours of battery life, its rarely a concern since I usually don’t spend more than 6 hours in the field at a time, and in the lab, I can always plug into AC power. On the rare occasions I need to take photos in the field, my camera bag either slung over my shoulder, or not far away in the truck, and honestly the low megapixel rating for every tablet currently available, not the mention the poor optics compared to the DSLR I use, make cameras, or the lack thereof, a non-issue. I had difficulty justifying paying almost twice what I paid for my AspireOne just to have something that’s a bit more convenient. The Kindle Fire meets my usage requirements nicely, and does so at a budget price. I purchased one for my mother because she doesn’t care for her Windows Vista notebook, and she mainly browses the web and writes email. She does not play games, nor read books electronically (although I hope that changes once she gets her Fire), and she prefers to watch movies on a television. As for my sister, she an executive with Clinique and travels often. I haven’t been able to sell her on the Kindle e-reader yet, and much like myself, she’s a bit frugal. However, her birthday just happens to be November 15th, and I thought this would make a good present, as well providing her with a small consumption device that fits nicely into a purse. In regards to my younger cousin, she is still a high school student and has been itching for a tablet for awhile now, but her parents weren’t willing to spend $499 to get her one, in the event she lost it, dropped it, or some other accident befell it. At a price point of $199, it’ll be an inexpensive Christmas gift from which she will get plenty of use. Her high school has Wi-Fi access, and of course at home, Wi-Fi connectivity is available, so instead of using the family’s single computer, she can lay on her bed and read, or watch a video, or send emails. It seems 9.7″ and larger tablets are really a device for a highly mobile creator of content, and not the average computer user. I recall watching a video on CNET from Molly Wood, where she cites market research that Citigroup conducted with 1800 respondents who owned tablets, and they found that the vast majority did absolutely no content creation whatsoever. I think that research just cements Jeff Bezos foresight. I also think that Amazon will release a 9.7 or 10.1″ tablet that will be much more full-featured, and probably will do so in the next 6 to 12 months. At that point though, I will happily sell my Kindle Fire for $100 to a colleague and upgrade.